The most impressionistic visual of the 24 Galapagos Islands was the landscape. The islands, surrounded by the Pacific Ocean, survive with no natural fresh water. It must be shipped from the mainland of Chile although there are de-salting projects underway in Galapagos. All earth and rock are dry. And the effects on the environment where evolution sets the pace are curious. One island is like a trip to the moon with giant rock craters still implying bubbling cauldrons that aren’t active anymore. Some are high rugged cliffs colored by bird excrements and offering p recarious ledges for their nests. Others are long strips of low volcanos introduced by a border of white leafless trees that give a ghostly effect. Think aspen trees without leaves. When you get closer they are fronted by Opuntia, hairy cactus with paddles so tall as to be considered trees as well. There are no indigenous flowers left. What can be found were birthed from wayward seeds blown across the seas from the mainland or carried by birds. Since man settled, they planted their own fruits and vegetables. In green areas where mysterious caves hide petroglyphs and bats, where giant tortoises roam, wild vines of baby tomatoes cover the ground mixed up witha strange orange bell flower that is a hallucinogen which only the locals try and laugh when one asks for details. 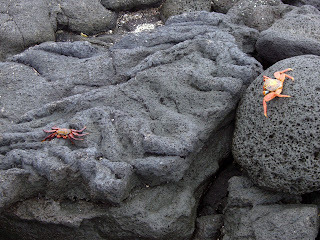 All of Galapagos is volcanic, whether rust brown rock or the ever present black lava rock near the sea. It was always a hiking challenge but visually incredible. Was this the environment of dinosaurs and prehistoric animals? As it is, a freaky looking giant iguana has taken over most islands. Charles Darwin said these "lizards", as he called them, had stupid faces. Frightening might be a better description, but they do nothing but lay around on each other on variations of lava rock and if disturbed, waddle away like a person whose belly was too fat for his legs to come together. Marine iguanas have manes, I guess you’d call it, from their head down to their tails, that look like pointed ivory teeth. These are formed by calcium in their meals. They love to bunch together in clusters and move away from the waters edge as the tide rolls in. Larger land iguanas live in deep holes they have dug out of dry soil in separate but equal type of communities. Believe me, as an extra, I encountered a number of geckos, and geckos don’t walk on hind legs and sell insurance in an Australian accent. Hiking across the black lava rock, I spent most of my time evaluating the variety of surfaces: some layers of dough ready to be baked into a croissant, other areas black petals trying to form enormous flowers, other times the lava had been pushed together into thin ridges on which you could balance your foot as you walked for a bit of reflexology. A walking stick for balance always helped, especially when you had to cross slippery lava rock freshly washed by salty waves, trying not to step on an iguana tale or touch an animal, or even catch yourself from falling by putting your hand on one of the cactus trees . Pay attention. Touch nothing. These were guide pleas. as we came and went to the airport. A last morning surprise was a different kind of wake up call: about a half dozen sea lions frolicked outside my stateroom. Was someone slipping them anchovies from dinner? A sea lion saying more than it knows. It's tragic that the innocence of Galapagos has passed into the realms of tourism. (I didn’t feel that about Easter Island.) Although the national parks regulate the numbers of people who can be on one island at a time, there’s still a hundred or so people unloading at dry and wet landings from Zodiacs and leaving their footprints where rare fauna calls home. I wonder what the sleeping and stretching animals think about the 130,000 oohers and aahers passing their perches. There’s always someone in the group who has to try to pick up the sally lightfoot crab, or pull the iguana tail, or touch the foot of the giant tortoise. People want photos of themselves with the animals, squatting down close as if they really KNOW this beast, breaking all rules to invade their space, some hanging back from the group to get done what he wants done undetected. It makes the advocate sensitive to the value of what these islands preserve furious. But what can you say? The guides sometimes turn their backs, reluctant to disturb a healthy and growing tourism. Alas, something must be done to police these nests of the rare mammals, amphibians, reptiles and fowl of the air, and to punish those who break the rules. Please, folks, have respect for a strange and exciting piece of the universe. Even the island’s population has increased by 50 per cent in a dozen years. Most come from Ecuador to ply the tourist trade. Costs of living are high - everything must come from the mainland of Ecuador - but then wages are high, too. To be able to have a residence on one of the four islands with settlement, one must either be born in Galapagos or marry a Galapagan. Although there is a one-strip runway airport, there is no formal harbor, so ships and yachts must anchor far away and drop their Zodiacs to come ashore. The parks do regulate what tour groups can be on what island at any particular moment. An approved ship would have a weekly schedule of visiting particular islands on particular mornings and afternoons of each day. If you missed, for example, one of those landings where the blue-footed boobies (they also have blue beaks and a crossed-eye look) hang out, you don’t get a second chance unless you stay another week. But the parks get theirs as they slap a one hundred dollar fee on each arriving tourist and this money goes to preservation and conservation. Now the airport, which has been outgrown ten fold, is enlarging to handle the enormous crowds of tourists arriving on Tamu and AirGal airlines. Baltra, the dot of an island, is nothing but the single airstrip where two or three planes are allowed to set down only three or four days a week and unload curious tourists fretting to find their group. Just in case, fronting the waiting area, are enough small tourist shops eager for business. At least they are confined to the airport. The pictures and critique are fabulous. It is almost as great as being there. Hope you are having the time of your life. Enjoy the ride!